If you have a modern Android phone or one of Apple’s current-generation iPhones, we’ve gotten word of a one-day Amazon sale that you definitely have to check out. 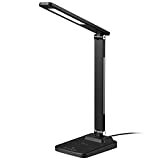 For the next 24 hours or so, you can save 15% on the AUKEY LED Desk Lamp With Built-In Wireless Charger. This great LED lamp has four different brightness settings and a sleek, modern design. It also has an integrated wireless charging pad so you can keep your desk free of clutter and still charge your phone. Just use the coupon code AUKEYT36 at checkout to get in on the action.